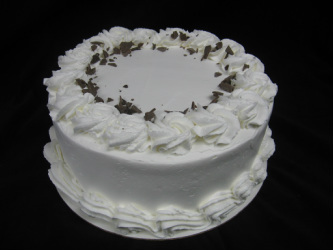 ​3 Layered cakes............​Available in 6", 8" or 10"
Need a lot of servings? Any of the below cake can be ordered in a sheet cake. Sheet cakes come with one layer of filling. 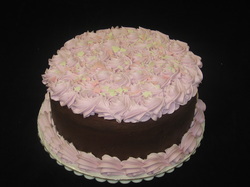 Chocolate Raspberry Cake: Chocolate Cake with layers of raspberry preserves and chocolate buttercream frosting. Iced with chocolate buttercream and drizzled with chocolate ganache. 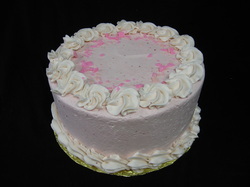 Raspberry Cream Cake: White cake layered with raspberry mousse and frosted with raspberry buttercream icing. Key Lime Cake: Love Key Lime Pie?, then try this cake! 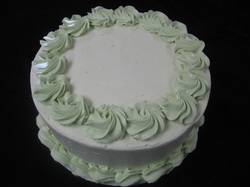 White cake layered with key lime filling and frosted with lime infused buttercream frosting. 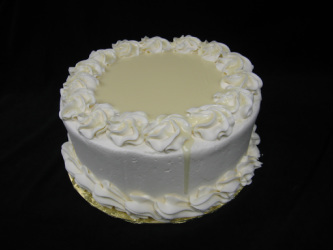 White Chocolate Cream Cake: White cake layerd with white chocolate mousse filling. 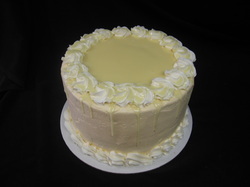 Frosted with vanilla buttercream frosting and topped with white chocolate ganache. 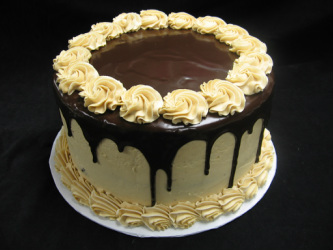 Chocolate Peanut Butter Cake: Chocolate cake layered and iced with a creamy peanut butter icing. 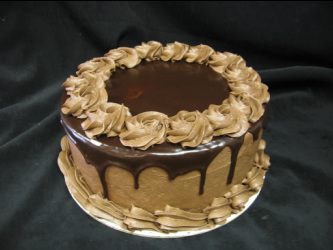 Drizzled with a rich chocolate ganache and garneshed with chocolate buttercream icing. 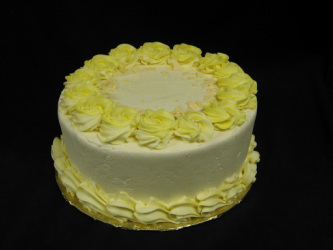 Lemon Cream Cake: Lemon flavored white cake layered and topped with a delicious lemon curd filling and iced with a lemon infused buttercream frosting. Carrot Cake: A moist carrot cake baked with walnuts, pineapple and raisins. Covered with a delicious homemade cream cheese icing. Garnished with crushed walnuts. Just like grandma used to make! 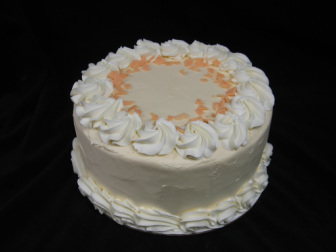 Orange Dreamsickle Cake: A moist white cake flavored with a hint of orange layered with white chocolate mousse. Iced with an orange infused buttercream icing and topped with white chocolate ganache. Taste just like a dreamsickle pop! 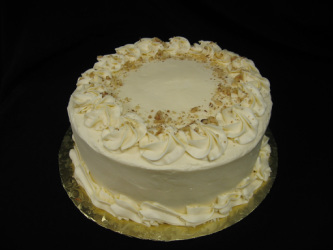 Orange Divinity Cake: An airy white cake flavored with a hint of orange and layered with a rich orange sauce. Iced with an orange infused buttercream icing. Garnished with chunks of white chocolate. (Cake is available with orange or chocolate buttercream icing. If nothing is specified, orange will be used). 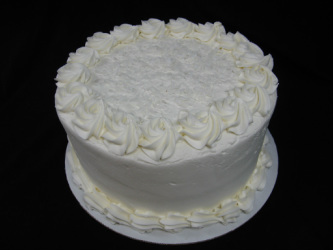 Coconut Cream Cake: A coconut infused white cake layered with a coconut custard and iced with a coconut flavored buttercream frosting. Garnished with shredded coconut. Heaven and Hell Cake: A moist devils food cake and an almond infused angel food cake layered with peanut butter mousse and iced with a rich chocolate ganache. Strawberry Shortcake: A moist yellow cake with layers of strawberries and whipped cream. 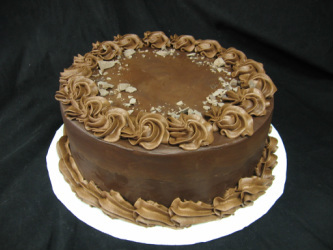 Triple Chocolate Cake: "Our most popular". Four layers of moist chocolate cake layered and iced with chocolate buttercream. Topped with a rich chocolate ganache and chocolate rosettes. A chocolate lovers dream! 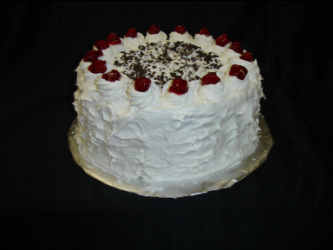 Black Forest Cake: A chocolate cake layered with cherry filling and iced with a whipped cream. Garnished with chocolate shavings. 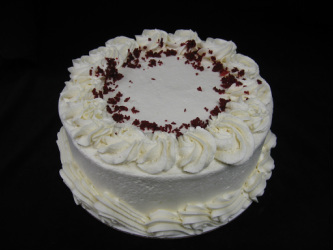 Red Velvet Cake: Home-made moist red velvet cake, just like grandma used to make. Layered and topped with home-made whipped red velvet frosting. 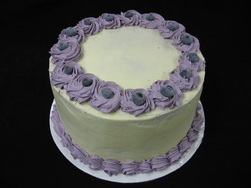 Lemon Blueberry Cake: A moist lemon cake layered with blueberry filling and lemon buttercream frosting. 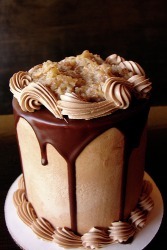 German Chocolate Cake: Chocolate cake with layers of coconut-pecan frosting and chocolate buttercream frosting, just like your grandma used to make. Boston Cream Cake: Yellow cake with layers of vanilla custard and topped with a rich chocolate ganache and whipped cream. 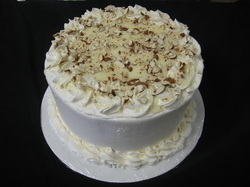 Almond Cream Cake: White cake w/almond mousse filling and almond buttercream frosting. Topped with white chocolate ganache.